Villa Manzu is one of the most exceptional villas for a luxury destination wedding in Costa Rica we at Arenas Foto Wedding Photography have encountered. It’s a secluded villa on a secluded peninsula in a sparsely populated area that can easily boast of its stunning views of the Pacific Ocean, its luxury honeymoon suite and accommodations for your wedding guests as well as common areas, its unique design, its numerous and impressive amenities at the villa and offsite, its private chefs, and unforgettable sites for your wedding ceremony, reception, and more. Villa Manzu is located on the remote Papagayo Peninsula, and is a quick 45-minute trip to the closest airport by car - Daniel Oduber Quiros International Airport (LIR) - and 4 - 4-1/2 hours from Juan Santamaria International Airport (SJO). Transportation to and from LIR is included. The villa can arrange transportation to and from SJO by charter plane or helicopter to LIR if you fly in to SJO. For rates if applicable, please contact the villa directly. 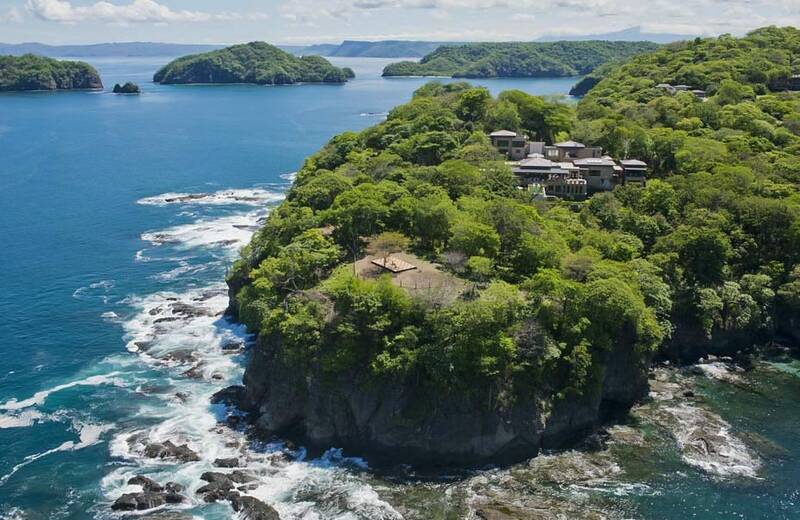 Arial view of Villa Manzu on an isolated tip of Peninsula Papagayo. Villa Manzu is the epitome of luxury and seclusion. It’s super-luxury 30,000 square foot villa situated on 5 acres on the sparsely populated Papagayo Peninsula, making it a superb choice for couples wanting a luxury destination wedding in Costa Rica with amazing views where the paparazzi can only dream of entering. The visionary architect who designed Villa Manzu, Abraham Valenzuela, wanted guests to have a sense of and storytelling as they experience the villa. He achieved the element of surprise by having the design of the villa lead the gaze of guests to something in particular, such as a work of art, or to another part of the villa, such as a courtyard, the end of a hallway, a courtyard or a passageway into another space. From the ceilings to the baseboards, Mr. Valenzuela’s attention to detail and the incorporation of other cultures and references to important works of art is evident, from the symbols of African, Indian and Latin cultures carved in the custom doorways to the artwork on the ceilings inspired Van Goh’s Starry Nights, as well as the Balinese, Thai, Mayan, and local Chorotegan cultures the infuse the architecture to create a positive, welcoming, open experience. Gorgeous living room with lots of natural sunlight and great views. For all your wedding-planning needs, the villa can recommend a first-rate wedding planner to plan all the details of your big day, from the lighting and music for your reception and other entertainment to the table ware and floral arrangements, from your bridal bouquet and his boutonniere to the main course, desert, and drinks, so your wedding at Villa Manzu will be the day you’ve been dreaming of. You and your bridesmaids can have your hair, makeup, and nails done in the privacy and luxurious comfort of your bridal suite or at its unbelievable onsite spa by its excellent stylists, makeup artists, and manicurists. 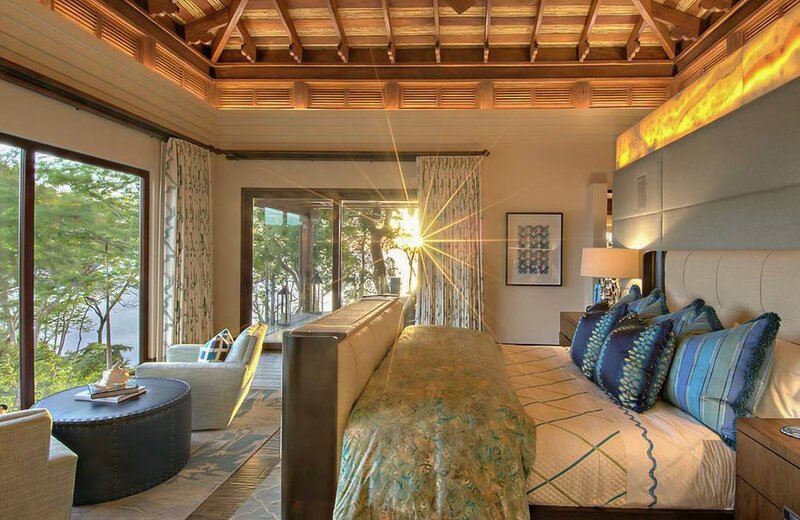 Villa Manzu can accommodate up to 22 overnight guests in its 8 oversized suites with mesmerizing ocean views for your wedding guests, with bed sizes in each suite ranging from a double king bed to twin beds. All of the suites feature a full bathroom with natural stone baths, showers, and tile, large-screen televisions, walk-in closets, aromatherapy diffusers and more, so you and your wedding guests will be steeped in luxury. On your wedding night, the villa has a private section reserved exclusively as a honeymoon suite where a romantic bath and couple’s massage awaits after your celebrated your nuptials with your family and friends. Villa Manzu is best suited for small, intimate wedding ceremonies for couples wanting an extremely exclusive and private location. The villa can accommodate up to 50 guests on your wedding day and has two sublime locations at the villa with stunning views of the Pacific Ocean and mountainous rainforest surrounding the villa for your wedding ceremony, cocktail hour, reception, and dinner. For a memorable sunset wedding, Sunset Point Platform is a great location for your ceremony given its striking ocean and mountain views. It’s also ideal for post-ceremony drinks and for your reception where you and your closest family and friends can celebrate your nuptials as the Pacific Ocean swallows the sun and into the night. Villa Manzu’s Main Terrace is another exceptional site for your wedding day events. It has covered and uncovered areas for ceremonies and receptions that also have memorable views of the ocean and mountains, and has bar downstairs for cocktail hour or the drinks can be served on the terrace above. View of the covered and uncovered areas at the Main Terrace at sunset. Near Villa Manzu, there are three secluded, private and very romantic beaches available only to guests that are but a short hike down an at times steep hiking trail. You and your wedding guests can also take the villa’s private yacht to many of the nearby beaches for truly memorable wedding ceremony. Thinking of a Villa Manzu Wedding? · Children of all ages are welcome at Villa Manzu. · Villa Manzu allows weddings any day of the week, any time of the year. · Fireworks can be arranges for your wedding celebration. · A DJ and live music are permitted until 2:00 a.m. · Villa Manzu charges an event fee to cover the cost of cleaning. One of the gorgeous pools at Villa Manzu. What to do before and after your wedding? Where to start? Villa Manzu has its own spa located on a floating platform under two 30-foot waterfalls whose water flows form the infinity pool where you can enjoy detoxification treatments, various types of massages, facials, skin exfoliation, body wraps, customs treatments and more. For exercise and relaxation, have a dip in its infinity pool with stupendous ocean views, workout in its full gym where you can workout on your own or have a trainer give a custom exercise class. Or, take a trip to the nearby tennis courts and Arnold-Palmer-designed golf course to play a few sets or a match on grass or clay courts, or a few rounds of golf on the Four Seasons golf course. There’s also a world-class yoga teacher onsite! Then there are the two nearby beaches – Nazocol y Prieta Beaches or a private beach accessible only to Villa Manzu guests – you can visit on foot or a short ride by in one of the vehicles available to guests, or explore them and the ocean on the boat for villa guests. As for adventures and activities, the possibilities are endless. Go surfing, snorkeling, diving, or stand-up paddling with one of the villa’s act ivies guides, visit the exceptional waterfalls and volcanoes all over Costa Rica and get in a natural volcanic mud bath or take a dip in natural thermal spring, go sport fishing, river rafting, mountain bike and ATV riding, diving, snorkeling, jet skiing, paddle boarding, horseback riding, charter a helicopter for scenic tours, go to a cocoa and coffee plantation or to a chocolate factory, go snorkeling, diving, Or, stay at the villa and watch the breathtaking sunsets while sipping an exotic drink. Stay in shape beofre and after your wedding in Villa Manzu’s complete onsite gym. Villa Manzu does not have a restaurant. Even better, they have 3 private chefs who will cook you three delicious meals daily before and after your wedding, and who will work with you to create a unique a delicious menu and drinks for your dream wedding at Villa Manzu. Staying at Villa Manzu is like renting a luxury yacht or a fine boutique hotel solely for you and your guests. To stay with us is to experience service and luxury you have never known. Our clients stay at the most exclusive properties in the world and hold Villa Manzu in higher regard give our world-class customer service and attention. It is very rare to have access to such an exquisite home that is used only for rentals. This allows for ultimate privacy an in gorgeous and intricately designed 27-million-dollar home in an otherwise inaccessible location all while being served by staff known for its unparalleled service and surrounded by all the remarkable natural beauty of Costa Rica, making Villa Manzu a once-in-a-lifetime experience you will talk about for years. Your wedding is an once-in-a-lifetime moment. Your wedding at Villa Manzu will be even more unforgettable. Having a once-in-a-lifetime villa manzu wedding? Your wedding Photos Should be equally Memorable! Contact Lindsay & Andrés Today! Click here for more luxury wedding destinations in Costa Rica!